I’ve been catching-up on my business reading. I always find something fascinating when I do…. 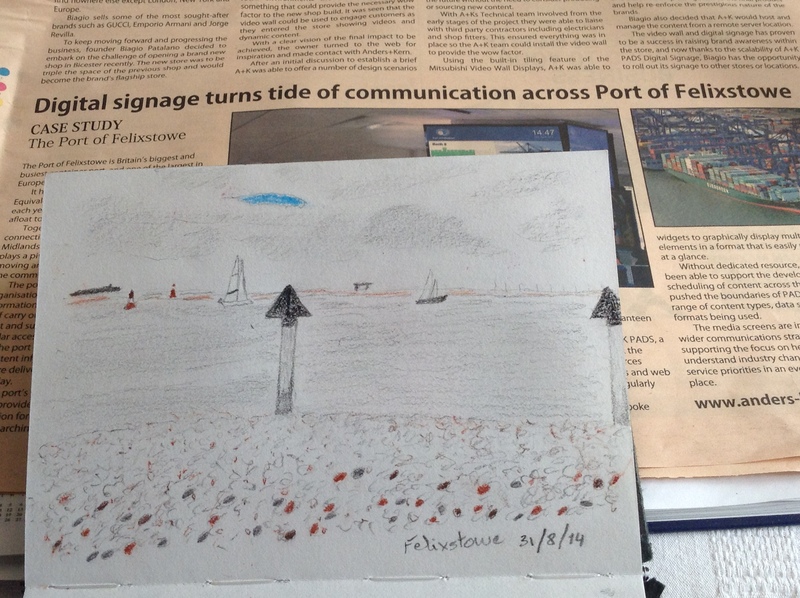 I’d been impressed, whilst sketching* on the beach during a late summer trip to Felixstowe, by the size and frequency of the cargo ships going across the horizon. 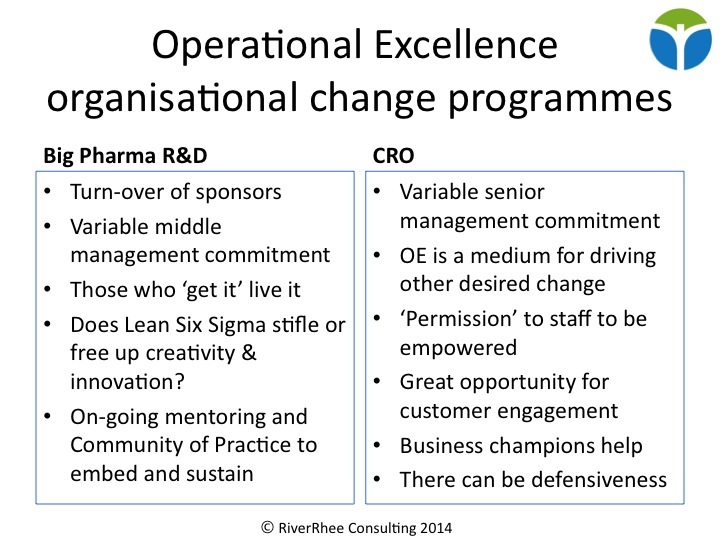 I’m always intrigued by how organisations engage their staff in a commitment to operational excellence. Most business teams collect metrics or KPIs (Key Performance Indicators) on their performance. It’s a requirement from management. Variations on cost, time and quality – often expressed as frequencies, quantities, timings etc. – are dutifully collected and included in monthly reports. 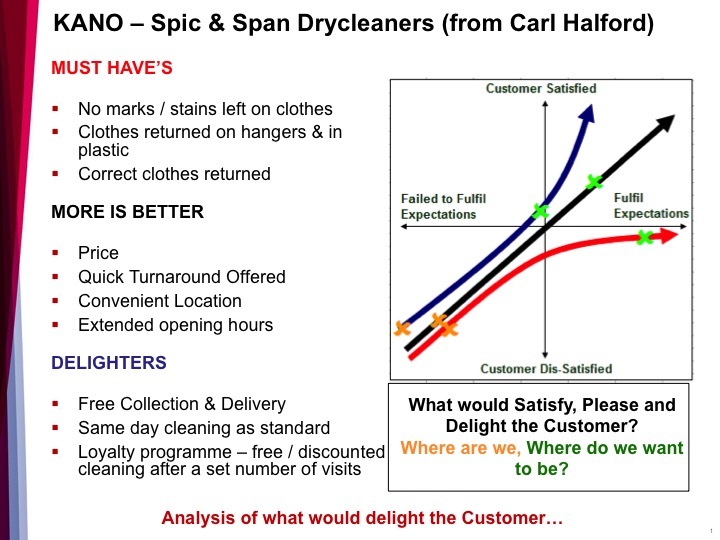 Are the right things being measured: will they give us meaningful and useful information on how we are performing in relation to our customers and our goals? Is anyone paying attention to the metrics and using them to make decisions, to improve performance on a continuous basis, to monitor whether anticipated benefits are being delivered? Have we in fact got too many metrics? One of the things I enjoy about working with multiple customers is witnessing the diversity of their approaches and hearing about examples of operational excellence. One company uses ‘stand-up’ meetings at the start of the day and at lunch time (to catch people working on different shifts). They update a white board in a narrow corridor with their key targets and up to the minute metrics on performance in relation to customers and operations. The local manager or supervisor runs through the figures, celebrates achievements, asks for comments and suggestions. One or two members of staff might also share an item of news or a good practice. The narrowness of the corridor and the absence of chairs help to ensure that the meeting is very brief – it lasts 15 minutes at the most. Everyone is engaged, informed, energised and committed to the organisation’s aims and their roles within it. Other organisations have more sophisticated white boards or electronic displays in more spacious locations that can be viewed as people go by as well as in similar ‘stand up’ briefings at key points of the day or working week. The article describes how the information communicated includes ‘progress against customer service targets’ and ‘changes to operational procedures’. This is all very good to hear about. It would be wonderful to get an inside view on the impact that this approach to the visual workplace is having on employee engagement and operational excellence. How are you engaging your staff in operational excellence? Do you have some form of visual workplace? Elisabeth is accredited in Change Management, in Lean Sigma, in MBTI (Myers Briggs Type Indicator) and is an NLP (NeuroLinguistic Programming) Practitioner. She is a member of CILIP (Chartered Institute for Library and Information Professionals), APM (Association for Project Management) and is also registered as a Growth Coach and Leadership & Management trainer with the GrowthAccelerator. About 40 people attended this evening seminar in Coventry on 30th January 2014. The intent was to share a case study based approach of some of my experiences of leading and facilitating operational organisational change projects, and of using Lean and Six Sigma to support organisational change. It also proved an excellent opportunity for the participants to share some of their experiences, and for all of us to learn from each other. The delegates present appeared to be a mix of practitioners and consultants in project management, all of whom had encountered Lean and Six Sigma in some form. It also became apparent as the evening progressed, that many of those present had a real interest in organisational change, with experience of the challenges and some of the successes involved. Coordinating a group of cross-organisational champions involved in rolling out Lean and Six Sigma as a way of working in a global Pharmaceutical R&D organisation. I was also one of a team of four trainers for running three-day (Advocate or yellow belt), and two-week (Expert or green belt) training courses, and coordinated site-based ‘lunch and learn’ sessions for ongoing mentoring of the practitioners. Leading a global R&D programme consisting of several project work-streams for developing solutions, and implementing new governance and procedures to address the major outcomes of an internal audit. 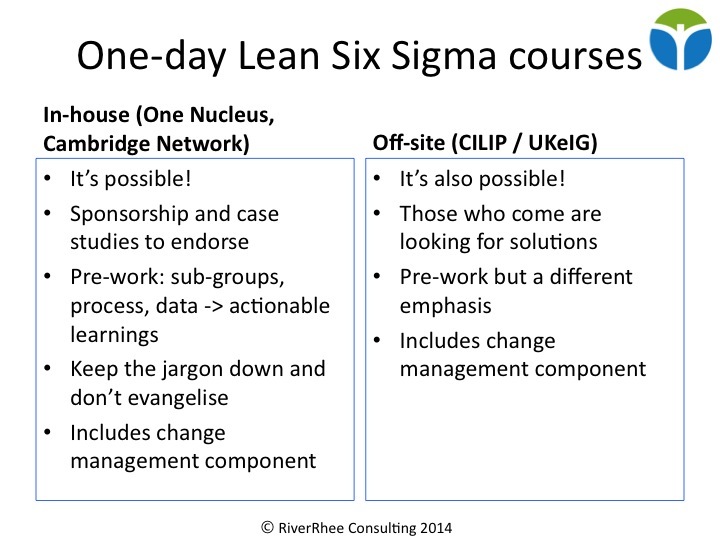 Running one-day in-house and off-site courses in Lean and Six Sigma, and in Change Management. 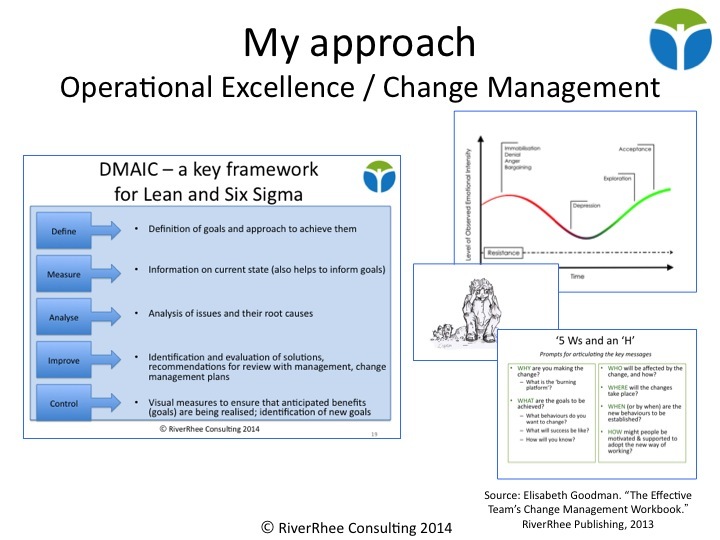 It was obviously not practical to go into these approaches in any depth within the time available but my key framework for Lean and Six Sigma projects is the DMAIC framework: Define, Measure, Analyse, Improve, Control. My approach for Change Management is described in my new book: The Effective Team’s Change Management Workbook . It addresses the behavioural aspects of change: personal journeys through change; how to move from being a victim or survivor through to being a navigator of change. Clients I work with have found it very constructive to be able to articulate their concerns in a ‘safe’ environment as well as explore how they could tackle the change in a more positive way. My approach to change also addresses procedural aspects, for instance using a checklist of questions (why is the change happening – the “burning platform for change”, what are the goals, who will be affected, when, where and how). Again, my clients have found this relatively simple approach extremely helpful for articulating and gaining alignment on the key messages for their change strategies. 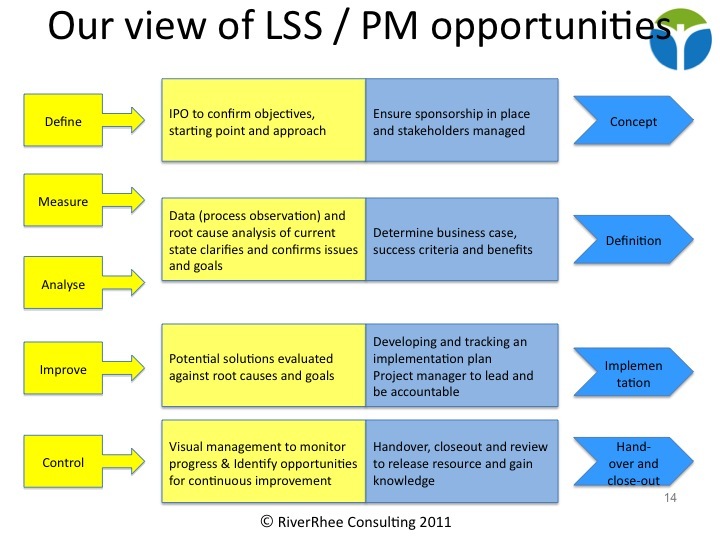 I also referred to a previous APM event that my Associate John Riddell and I had led in Stevenage and Norwich a few years ago [Lean Six Sigma and Project Management]. In this seminar we explored the potential intersections and opportunities between Lean and Six Sigma and Project Management. The participants in the Coventry seminar spent ten or so minutes in ‘huddles’ exploring their challenges, successes and questions and then shared the main themes with the rest of the room. Some of these challenges, successes and questions were reflected in the detail of the case studies that I then shared. It would take another blog or in-depth white paper to go into the detail of what I presented, so I am only posting the main slides here. Do post a comment of anything you heard that you would like to highlight if you were at the event, or get in touch with me if you would like to learn more about what I covered. Sponsorship. A theme that sparked a lot of interest was that of sponsor turnover and the importance of getting the right sponsor with the right level of commitment. Participants thought that there might be a tipping point: when the project is far enough along, or there are sufficient numbers engaged for the sponsorship to no longer be such a key factor for success. The importance of having strong senior sponsorship may also vary with the scale of the organisation, or of the change involved. Certainty and Control. What makes change scary for people is not knowing what is going to happen, and what is happening not being under their control. Even if the news is bad, knowing it is better than the guessing and rumours that go on with a lack of information. 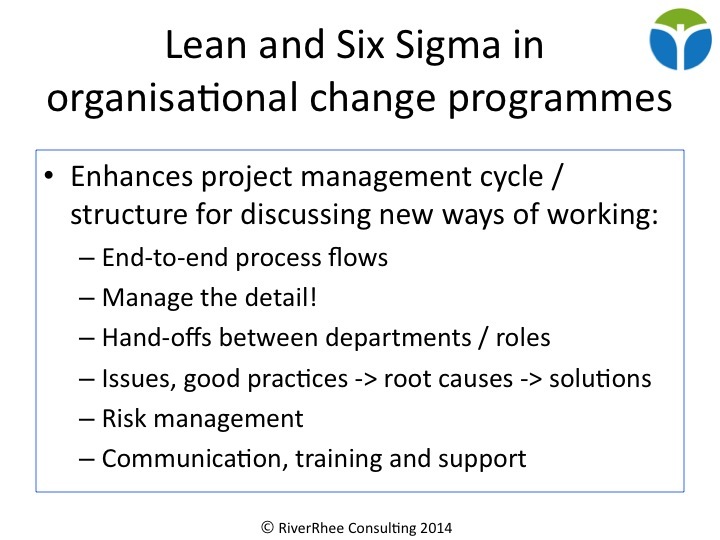 Lean and Six Sigma approaches give people the opportunity to influence the change. 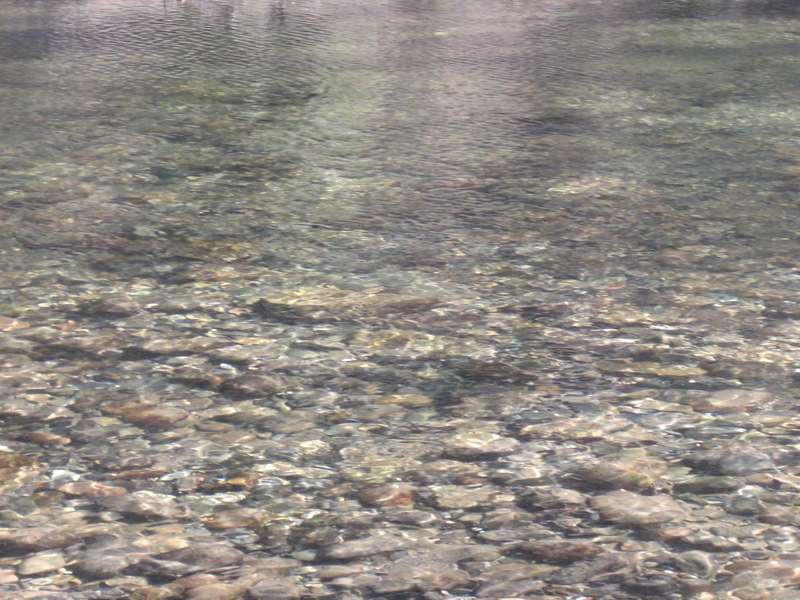 Using representatives / champions supports two-way flows of information. 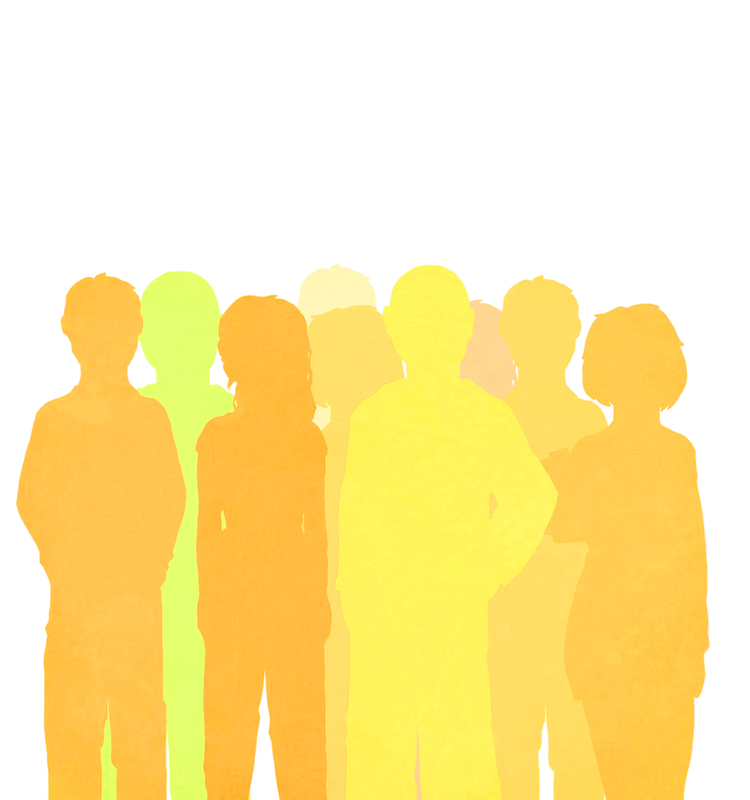 Focus groups can also be a good way to involve people. Lean and Six Sigma can be applied in non-repetitive, creative and service environments. There is an excellent book by Michael George, Lean Six Sigma for Service that I’ve also referenced in a previous blog [Lean Six Sigma in R&D and service delivery]. My experience of working with scientists in drug discovery, and with people in finance and human resources is that there are always some processes in every type of work that can benefit from being simplified and streamlined to free up creativity. For the discovery biologists it was the critical review of their cascade of assays for evaluating new chemical compounds as potential drug candidates. People who ‘get it’ live it. One delegate was particularly taken by this phrase: finding such people makes our work as change agents easier. They are certainly the champions or sponsors to start with, especially in organisations that are “too busy” firefighting (and rewarding firefighting [Getting it right rather than firefighting]) to take the time to apply Lean and Six Sigma to make more time. 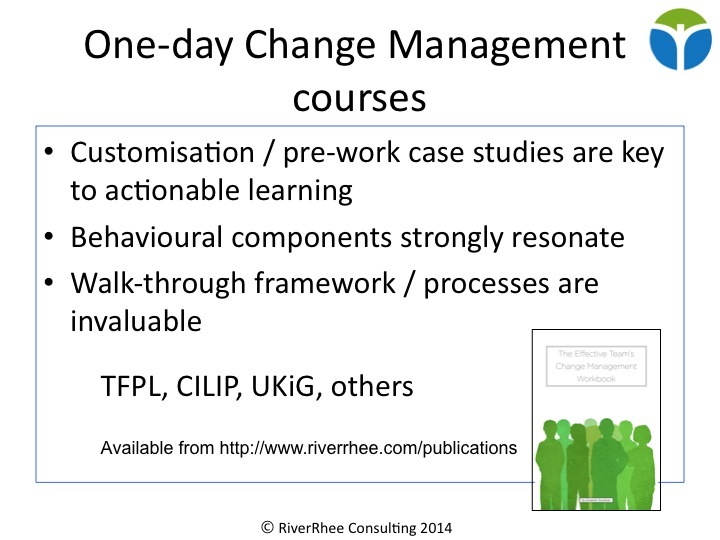 Effective organisational change is not easy! There will always be complications and questions to answer to enable the smooth running of organisational change programmes and projects. However, some of those present, who were early on in managing their change projects, were reassured by the fact that the evening’s discussion confirmed that they were going about things the right way. This was an excellent occasion for the chairman of the new APM Enabling Change SIG, Martin Taylor, to share a few words about the scope, status and next steps for this group, and I will also be sharing these notes from the seminar with my colleagues on the committee. 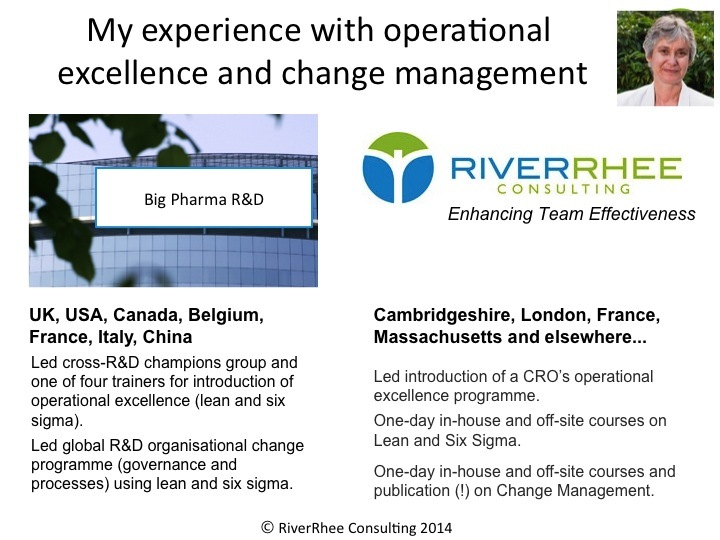 The full presentation of Facilitating Operational Excellence in and for business change projects can be viewed on SlideShare. She is currently a committee member for the APM East of England branch, and for the APM Enabling Change Special Interest Group. I have just spent a very comfortable night in a Heathrow hotel, after a 5 hour round trip spent in the air somewhere between London and Boston. Although eating airline food, watching a (not very good) movie, and having a doze mid-air might be one way to spend an afternoon in May, it would not be my first choice! It was the culmination of a series of misadventures that, viewed positively, provide an interesting case study on ‘Failure Modes and Effect Analysis’ (FMEA), or indeed Risk Management. Put simply, FMEA is a technique that enables a team to identify what might go wrong and develop appropriate mitigation plans based on the probability, severity and ease of detection of the various ‘failures’. The 3 metrics are assigned numeric values which, when multiplied, produce a Risk Priority Number (RPN). The mitigation plans are prioritised based on the RPN of each failure. The technique originated in the US army, and spread from there into various industries, including manufacturers such as Toyota and is now part of the American Society for Quality’s tool-kit. This blog is written from the perspective of Lean and Six Sigma practitioners who use FMEA to evaluate current processes, and also potential solutions to the issues needing improvement. Project Management practitioners’ Risk Management approach is also a variant of FMEAs. I was due to catch a 3:00 pm plane from Heathrow to take me to Boston for a business assignment. The journey involved catching a 10 o’clock train to London from my home village in Cambridgeshire, the underground to Heathrow, and then the plane. My train and plane tickets were booked and I allowed plenty of time. What could go wrong? How did I end up staying in a hotel in London instead? Getting to the station. I had to take my daughter into Cambridge, usually a 40 minute round trip which would get me home by a little after 9:00 am, so lots of time to walk to the train station. However, there were some roadworks in Cambridge so that at 8:50 am we were still a long way from our destination. Luckily I found an alternative route, dropped her off and was home by 9:30 am and so at the station in good time. Getting to Heathrow. The train was on time. I picked up an underground train going to Terminal 3 straightaway. Check –in was from just after 1:00 pm, by about 12:10 we had passed Hounslow. I could relax. Not so: a defective train at Hatton meant that we had to go back to Hounslow and catch a bus to the airport. By 12:40 the number of passengers waiting for the bus, and the scarcity of the bus itself, made this look impossible. Some fellow passengers and I caught a cab, reaching the Terminal by about 1:15 pm. No problem. Getting onto the plane. The lady at the check-in desk patiently pointed out that I should have filled in an ‘ESTA’, the online equivalent to the ‘green form’ that I’d regularly filled in on previous flights to the US, but my last one had been about 4 years ago. So, off to the internet lounge to fill one in. Took me a little while due to my by then slightly agitated state, but got it done, and got checked in and to the boarding gate still in reasonable time. Flying to Boston. We didn’t make it! 2 ½ hours into our flight time, the captain announced that a mechanical fault had been detected, and we were going back to London. Everyone kept calm, and so after 5 hours, we landed safely, queued for our luggage, queued for our passes to local hotels, and there I am now, waiting to go back to the airport for the replacement flight. Getting to the station. We do the journey into Cambridge on a daily basis, and although it can be slow, especially if it’s raining, we still manage to get home by a little after 9:00 am. However, there had been some roadworks the previous evening and if still there, they could have caused problems, which they did. So probability high, severity medium but detection high had I thought about it! I could have prevented the delay by listening to the radio before setting off or simply taking a different route from the start. Getting to Heathrow. Train problems are frequent! So high probability, high severity, medium detection capability. I checked the train live departure information on-line before setting off and everything was fine. Underground train performance is less predictable, however the information boards and announcements also indicated the Piccadilly line was running normally. I allowed an extra half-hour before the start of check-in, in effect 1 ½ hours before the close. Flying to Boston. I am sure there are statistics on the likelihood of something going wrong during a flight, though most of us probably would prefer not to know. The severity will obviously vary depending on the nature of the problem. Luckily the in-flight detection system worked. The cost of this incident to the airline in accommodating us all in hotels and in arranging replacement flights is very high. From a business point of view, and from their customers’ peace of mind, let us hope that they adopt a rigorous FMEA procedure of their own when preparing for each flight. I hope you agree that this makes for an interesting FMEA case study. I’ve certainly learnt some lessons from it. I’ve gone on-line already to see if my ESTA is valied for today’s flight but can’t find it on the system – so will be going to the airline’s customer desk in good time to check on this and possibly re-do it. Hopefully by this evening I will be in Boston.